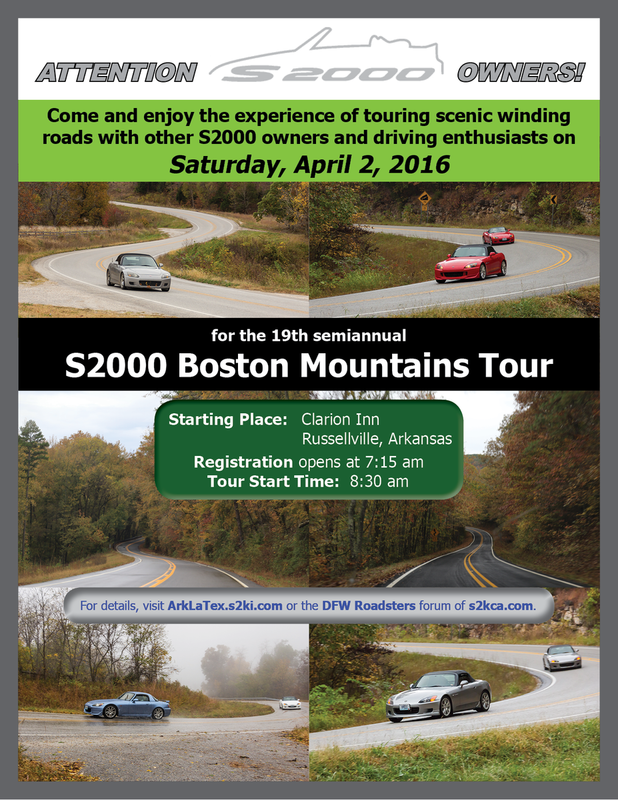 [b]Dear Friends, You are invited to attend the 19thSemi-annual S2000 Arkansas Boston Mountains Spring Tour 2016. The Spring 2016 Tour will cover some of the best winding and scenic roads that the Arkansas Boston Mountains range have to offer. These roads can offer something challenging to even the most experienced drivers. Mandatory Drivers Meeting: 8:15 a.m.
Tour Start Time 8:45 a.m.
WE WILL BE ENDING BACK IN Russellville, Make your reservations for two (2) Nights. $119.84 + tax/ Night for a King suite. OK Still (Ron) Welcome back!! Dragondidg (Michael) ALL the way from New Orleans Welcome Back!! Bama Dave (David) All the way from A-L-A-BAMA Welcome back!! !